Rolling along the gentle hills of South Shreveport down Ellerbe Road will take you on a peaceful journey where you can find a truly beautiful neighborhood called Lakeside. Lakeside is situated on a little peninsula in Long Lake. Many of the homes in Lakeside are lakefront property consisting of large gorgeous houses that provide contemporary amenities since the subdivision was built. Lovely and careful landscaping is characteristic of all the medians and generous yards, while a speckling of mature pines, especially along the waterfront, give a woodsy feeling to the neighborhood. Lakeside is a short commute from Shreveport and is indeed worth the absolute graceful cleanliness and serenity that one gains out in this part of town, as Lakeside is quite removed from any degree of city chaos. Access into town is simple by way of either Southern Loop to I-49, or down Ellerbe Road. From there, one can then easily reach Youree Drive and the large amount of Shreveport business life located there, including Willis Knighton Pierremont Health Center, and the LSUS campus. Schools serving Lakeside neighborhood are Youree Drive Middle School, Captain Shreve High School and University Elementary School. 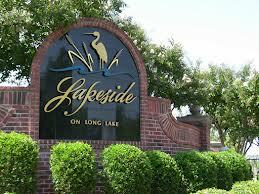 Lakeside neighborhood offers the perfect paring of lovely spacious contemporary homes with a serene lake environment.